Conversions are turning the big shopping centers into something else entirely. JoAnn Greco reports. Jason Jordan notes that the environment is now at the top of the agenda in Washington. The nation adapts to its growing minority population. Nate Berg tracks the trend in Planning Practice. Beach erosion is challenging North Carolina coastal towns. Carole Moore explains. Faith Cable says that Germany offers lessons for U.S. planners. The Kenyan capital aims to be a world-class metropolis. Denis Gathanju is on the scene. Meghan Stromberg hunts for bright spots in the planning job market. A monthly column on statistics in the news — compiled by APA's Research Department. This month: exurbs. Reid Ewing on the impact of self-selection analysis of travel behavior. New reports, blogs, video, etc. No doubt about the design-obesity link. 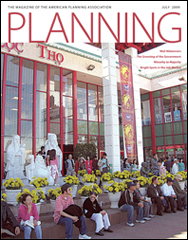 Cover: Little Saigon's Asian Garden Mall, Westminster, California. Photo by Wendy Grant.